The script is on "https://test.dev.mydomain.net" (not the real address obviously). Judging by websocket spec, the exception should also appear on Chrome/Firefox... but it does not. So I doubt it has anything related to HTTP/HTTPS. In any case, I am using a wsS socket on a httpS page... Moreover: when I replace the wss address by another valid server found on an online example, it works. EDIT: adding the sites to the trusted zone does not work either. It looks like IE throws a SecurityError if you're trying to open a websocket on a local (intranet) domain. To overcome this, you may disable IE's automatic algorithm for recognizing local sites. This can be done in Tools > Internet Options > Security > Local Intranet > Sites. Uncheck all checkboxes (or only a particular one, if you know how exactly your domain did end up in intranet ones). Note that IE uses (among other things) its proxy settings to determine local sites: if your domain is listed as excluded from proxying in proxy settings, then it will probably be treated as intranet one. This is why WebSockets work if you enable Fiddler: it modifies IE proxy settings and thus the list of intranet sites changes. Well, my question wasn't that successful, so I'll post the "workaround" I found. I got another address for the website, in 194.247.. too. This, magically, solved it. Guess IE doesn't like mixing local and external stuff and watches the IP. Anyways, I hope this may come in handy to anyone who's got the same issue. I had this problem in Windows7/IE11 after applying a security patch. For Windows10/Edge is the same story. As this is a local websocket (ws://localhost) you have to add ws:\\localhost\ to Internet Explore configurations (Tools > Internet Options > Security > Local Intranet > Sites > Advanced). In Windows 10/Microsoft Edge you will find this configuration in Control Panel > Internet Options. The address of your webapp (https://test.dev.mydomain.net) must be added to the local intranet zone too. Note that in the image the webapp address should be added. Browsers has a websocket limitation. 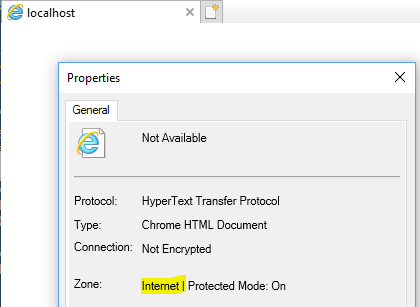 For example Internet Explorer has default limit of websocket connections set to 6 per host header name. the same limitation is set for WinForms WebBrowser component. Second option how to solve SecurityException is to create multiple subdomains. The client hostname/IP Address should be same as server IP/Hostname thats listening to otherwise you would get the above error. I had to uncheck the box that says "Require server verification https:// " option. I had the same issue at one of my customer's environment. It turned out that they had a proxy configuration that did not allow the connection to the WebSocket endpoint directly and did not support the WebSocket protocol. The temporary solution was to disable using the proxy and everything started working. The long term solution is to edit the proxy's configuration (.pac file) to exclude the address of the WebSocket endpoint. To disable the proxy, go to: Internet Explorer Options > Connections tab > LAN settings button > un-check Automatically detect settings. In addition to making sure that the internet zone is not localhost (as in above answers), ensure that if https is used, then wss should be used. This is not an issue in other browsers, but IE is abit more finicky. How to solve SCRIPT5022: SecurityError on Internet Explorer?